I'm planning to digitise some material, mainly home-taped VHS VCR's, going back 25 years or so. I have read around this site and others and I am enormously grateful for all the helpful information posted. I have a reasonable condition consumer VCR and I was going to use this to begin with, at least to see how good the results are. After that I might try to get hold of a 2nd hand SVHS or pro-deck - but that might be more trouble than it's worth because you don't know what the condition of them is reall going to be. I understand I should probably use a TBC. I could get a TBC1000 2nd hand or maybe an AVT8710. For a reasonable quality capture, if I want to mess around with the digital material, it seems to come down to an ATI AIW capture card or a capture to DV device such as the Canopus ADVC55 (I understand that the Canopus has an inbuilt TBC, but that this is only single line, so it would be better to have the separate TBC anyway. I also understand that the Canopus will not strip ot Macrovision whereas a full TBC will. This is not really a concern for me). I also understand that I can manipulate the digital material either as DV or AVI, though an uncompressed AVI files would be about 5 times as big and the required capture speeds correspondingly higher. HERE IS MY QUESTION. I've read a lot of comments about "uncompressed AVI" and seen it suggested that an AIW card will capture to uncompressed AVI. But I've also seen posts describing AVI as being compressed to some extent itself. Also that the output from an ATI AIW is not uncompressed AVI at all, but AVI compressed with an "ATI codec" . Can anyone explain this for me, or point me to an explanation. Sorry if it's already here; I have tried hard to find it. I believe the best description would be to say "raw" video. Check the glossary for more definitions. Basically CODECS are used to make video smaller and easier to manage as far as file size goes. DV codecs utilize about 13gb per hour. Thanks. I think I understand compression. So I believe DV is like "raw" AVI compressed about 5 times. What I'm not clear on is what "raw" means with reference to the analog signal. An analog signal has a certain no of lines, but the information within the line is potentially infinite. So with what resolution is it digitised into "raw" avi. Also with reference to the ATI devices, do these produce genuine raw AVI (whatever that really means) and if not what sort of compression is involved in the ATI codec? uncompressed avi and dv avi are different animals. DV AVI is a codec. There are a number of companies that produce dv codecs for their cameras. Panasonic is one that comes to mind. That is what uses the 13gb/per hour size ratio I was reffering to earlier. Uncompressed avi is HUGE. Even with tb harddrives it is still massive. I think using DV codecs would produce equally good results at much better storage rates. IIRC Fully un-compressed or 'raw' video uses 2-3 gig per minute. If a codec is being used (and it's easy to find out from the capture) then it's compressed. No ifs and no buts. But you are probably aware that there are several lossless codecs which will give a potentially higher quality than DV but at the end of the day it's a trade-off between quality and file size. DV is fine for the majority of captures and when if you are talking about a VHS capture then it's actually too good. Thanks again. Maybe we are at cross purposes. A device like the Canopus or a Datavideo DAC100 will produce DV output. So that must be compressed and have a codec. I understand that. Raw AVI is a different animal. I understand that too. But what is the horizontal resolution of raw avi? And are you saying that the ATI cards produce DV output and not raw AVI? Because that's not what the other posts appear to say. Are you saying the ATI codecs are actually DV codecs and thus that the ATI cards just produce DV the same as a Canopus or Datavideo ADC? Then what consumer or prosumer device could one use to digitise analog video as raw AVI? Apologies, I have read extensively on this area but I may not have fully grasped all the concepts. Video is broadcast using a different color system, YUV. Y is the grayscale brightness of the picture, U and V indicate the color. In a very simplified sense, Y=R+G+B, U=Y-R, and V=Y-B (or is the the other way around? I forget). The human eye has less resolution for colors so the U and V channels. So to save bandwidth in the broadcast signal U and V are broadcast with half the resolution of the Y signal. Video capture cards all capture in the YUV colorspace. And since the U and V channels have less resolution than the Y channel they generate half as much U and V data. This is called 4:2:2 subsampling. For every 4 Y values there are only 2 U and 2 V. This can be saved without compression in an AVI file. To identify the colorspace and subsampling the data is identified as YUY2 or some other "four cc" depending on the order of the Y, U, and V components. On average there are only 2 bytes per pixel so the files are 2/3 the size of uncompressed RGB. About 75 GB/hr. file size = 720 * 480 * 2 * 30 = 20,736,000 bytes per second = ~75 GB/hr. That's great Jagabo. It gives me a feel for what I was calling the "horizontal resolution". Anyone got any specific info on the ATI cards, whether they compress with a codec, and what its properties are if they do? Actually, I did not say that the ATI produces either DV or raw. An analogue capture card will capture according to whatever codecs the unit supports (and whatever is on your system). I have an hauppauge in this machine and that can capture mpeg1, mpeg4, lossy and lossless avi. And DV. These units are invariably software based capture. If it's hardware based capture then it's typically MPEG-2. I own an ATI AIW but do not use it for capturing as I did not like the interface. But if you are considering a purchase then of the two then I would go for the Canopus. However, the ADVC55 does NOT have a TBC. You would have to obtain the much more expensive ADVC300 for that. Thanks DB83. You're entirely right, I got my Canopuses (Canopi?) mixed up and it is the 300 that has the single line TBC - and indeed in the posts I have read that people seem to wow over. Which is the Hauppage card that captures lossless Avi? My response about cross-purposes was directed at Yoda313. You're right, you didn't comment on what the ATI card produces. But apart from an interface you don't like, can you tell me, what model it is, whether it outputs "raw" avi or avi compressed by some codec? I have never used the ATI for capturing. (it is the AIW 2006 model) I was looking for a card that would be compatable with PAL60 and, unfortunately, the chip was changed so I only now use it as a video card. So I'm afraid I cannot help you there. The hauppauge is a plain simple WinTv (PCI bus). As I said earlier, and unless I am very much mistaken, the card has the potential to do these captures but you still need the installed codecs to actually make it happen. So, even with this card, I get a list of different captures but only a few of them actually work due to the lack of the codecs which I felt I had no need for. It's different with a hardware based card as the encoding is built into the circuitry of the card. But then you have no control over the type of capture. Which is the Hauppauge card that captures lossless Avi? The ADVC-300 has a line TBC, the lower models do not. They just digitize the wobbly video to an h sync lock like any other simple capture card. ADVC units hardware encode analog to DV format. DV format has ~5x intraframe DCT compression and has all intact I frames for easy editing. "NTSC" DV uses 4:1:1 sampling, PAL uses 4:2:0. My last ATI AIW was an 8500DV. I don't know what the current models are doing. The 8500DV could cap uncompressed to YUYU or YUY2 4:2:2 varieties or apply a Video for Windows (VFW) codec or "partial hardware accelerated" encode to MPeg2 (various codec settings). You might want to look at Lordsmurf's site that covers the ATI AIW in great detail. I've moved on. Video sampling methods are covered here. Sampling is different vs. VFW compression coding. I recall in the older days of ATI that they featured two codecs of their own, VCR1 and VCR2. I believe that these were some modified version of mpeg-1 codecs tied to effeciency nonsense with their card/software, but I could be wrong. I think that the VCR2 was suppose to be the replaced (better) version, at the time, and I think it was based on the mpeg-2 format, but I could be wrong on that, too. ATI also shipped their own "uncompressed" codec versions. They featured the UYVY, (the reversed of YUY2) and also the YV12/YVU9 planar format. You might find them as atiyuv.drv and atiyuv12.dll and atiyvu9.dll files on your HDD. These are their *raw* or uncompressed codecs. But you have to have an ATI card and their capture software to be able to use them in your capture sessions. uncompressed just means that you don't want any compression applied to the captured video frames as they are received by your capture card via the codec. Your cap card is default-setup with YUV.422 color space. So, when you add in a UYVY or YVU9 codec for uncompressed capturing your video will be very large depend on the resolution to gave it. YVU9 is the swapped chroma planes of YV12, but the videos are the same. If you want to capture as uncompressed with the ATI card, you have to use their MMC software and set it to one of the codecs: UYVY or YVU9 or YUV9 or something like that in the config box. Huffy and Lagarith are the most common (lossless) compression. They compress every frame as received by your capture card. And then theres the dv, and mjpeg, they are (lossly) compressions. They will compress the hell out of each frame, but the mjpeg codec does have user configureable (compression) options and settings. I myself prefer to use the cedocida DV codec. For most capture projects its just the best codec all around. So if your video source is based off of digital cable or satellite or HDTV, then this is prob the best codec you'll ever need from an analog capture card. So, YUV.422 is as close as you're gonna get to lossless uncompressed video using one of the ATI codecs I mentioned earlier -- UYVY or YVU9. But, I would go with the UYVY if you really want to go uncompressed with your ATI card. But, for far less HDD space requirements, a compression type codec may be your best alternative: Huffy or Lagarith because they are as near lossless as you'll ever get. So, in summary, uncompressed is where you have a video source you want to transfer on to you HDD via your capture card and without any compression (via codec) applied in the video. Mmmm. I need to sit down with a wet towel round my head for some of this to sink in. DB83 says that if a codec is used, there must be compression. No ifs no buts. Vhelp seems to say (and I might have this wrong) that there is a codec in an ATI capture card which is an uncompressed codec. After the capture card, in my PC, I could use a further codec to compress, such as Huffy. Huffy presumably is software. The codec in the ATI card is presumably part of the functionality of whatever chips it uses so is hardware. A helpful distinction is made between lossy and lossless compression. Huffy is lossless. A Canopus DV codec is lossy. But I haven't 100% got my head round what the "ATI uncompressed codec" is actually doing. Compressing? Being lossy? The report shows two 10 second captures using the Hauppauge. The first is 'uncompressed' and you will see that the video stream is simply reported as 'RGB'. The second is 'DV' and reports that. I'm sorry if you are left confused. ..that there is a codec in an ATI capture card which is an uncompressed codec. After the capture card, in my PC, I could use a further codec to compress, such as Huffy. Huffy presumably is software. The codec in the ATI card is presumably part of the functionality of whatever chips it uses so is hardware. A helpful distinction is made between lossy and lossless compression. Huffy is lossless. A Canopus DV codec is lossy. There is no codec in the ATI capture card. The ATI capture card has internal circuitry that define how it processes video in a certain color space which is usually YUV color space. The defualt sampling (internally) is the 4:2:2 format. That side is all hardware. When you connect your card to a video source -- ie a VCR, you are directly connected in that color space from your cards point of view. The next link in that chain is whether or not you add in a plugin (or, codec) to act inbtween the cards *raw* YUV 4:2:2 incoming video stream to do something to it, like compress it further before finally sending it to your HDD. That would be the avenue of a (software) codec. The codec would take the stream (frame by frame, or field) and apply a function to the image. That function is the "compression", depending on the type of compresison that codec is designed for. It could be a lossy compression or a lossless compression. It all depends on the codec, and of course, your knowledge of such things, like when to use what, when.., etc. The codec I was refering to was the one(s) in the support files that come with the ATI driver cd disc. These drivers (codecs) are installed when you install ATI's MMC software. Once inside the MMC capture software, you can call up these codecs and select their function in your captures. So, say your card is internally YUV 4:2:2, as most are, and you want to capture as uncompressed video, then you would select the UYVY codec in the MMC software, and begin capturing uncompressed video to your HDD. Of course you would know what the codec is giving you (in this case, UYVY format) and so you need a software editor capable of reading (decoding) this type of video. It is uncompressed UYVY video. If your editing software does not have direct connection to this codec, it will not open it. That's why you need to know what you have and when/why to use it. When would you use UYVY (or YUY2, for that matter) or why would you use it ? These are all good question, but not important. The point I'm trying to make is like this, if you never driven a car before, why get in one and to drive it ? You don't know how. You need knowledge, and foresight about such things. Only later will sound so trivial. Would you bake a cake because you can, or because you like the cake, or because its your sisters birthday and you know she likes a certain cake, baked a certain way, and you have knowledge or foresight about how, when, why, etc, to go about baking a cake for your sister Something like that. Again, ATI also shipped their own "uncompressed" codecs, though they may be outdated, they are still useful. There's the UYVY, the YV12 and YVU9 planar format. You might find them as atiyuv.drv and atiyuv12.dll and atiyvu9.dll files on your HDD. These are their *raw* or uncompressed codecs. But you have to have an ATI card and their MMC capture software to be able to use them in your capture sessions. If you select these, your captures will be uncompressed video depending on which format you use, ie UYVY; YV12; or YVU9. Most capture projects entail YUY2 (a 4:2:2 sampling) but ATI's UYVY is the same but their chroma is swapped. Both videos will be the same level (quality) detail. Ok. So you heard about Huffy and Lagarith. These are also codecs. They are both, *lossless* codecs. They will intercept your YUV 4:2:2 video stream and apply a (lossless) compresison (as avi) and output it to your HDD, but the filesize will be much smaller. Your captured avi's will not be uncompressed, but will be compressed, lossless-ly. The format of the Huffy's output is usually YUV 4:2:2 (YUY2 format) and the lagarith, the same. But both can also output as RGB. But YUV is what you will mostly want and I wouldn't bother with questions on it at this time. DV is another codec. It is a lossy codec. It compresses the hell out of video but very good. It is the next best thing in terms of codecs, and I use it daily. It is not an uncompressed codec, it is a compression codec. A -- in this capture session, you decide you want to capture uncompressed using UYVY codec. B -- in this capture session, you deicde you want to capture compressed using Huffy codec. C -- in this capture session, you deicde you want to capture really compressed using DV codec. D -- in this capture session, you deicde you want to capture uncompressed, this time w/ YVU9 codec. E -- and so on and so forth. The Canopus DV devices do not have what would be considered a "real" TBC. The highest end one has a frame sync filter in it, but it doesn't clean the image quality at all. DV is not really a good choice for capturing VHS sources. The chroma is crushed really badly, and VHS is already very weak in this area. DV is best left for shooting new video, not compressing older formats. "Codec" is not the same as "compression". I think that's where confusion lies. You still need a codec to playback even uncompressed video. Your B and C examples would use third party VFW codecs (e.g. huffyuv or Panasonic DV codec) that are implemented in software the same as would be the case for a simple BT878 type card. The CPU takes the full load. The ATI AIW card also has hardware that accelerates a proprietary MPeg encoder option. Support for accelerated MPeg encoding is found only in the ATI MMC software. The Canopus ADVC series includes a 100% hardware DV encoder (CPU not used). Likewise, the Hauppauge PVR/HVR series have 100% hardware MPeg2 encoding. Vhelp that's a tremendously helpful expansion on your previous explanation. I am left with the understanding that the ATI cards can capture truly uncompressed AVI. I still believe there must be a "loss" in the chain described because as I understand it, a line of analog video contains an infinite amount of information, and in digitising it, the AIW must be making a cut in the quantity of informaton somewhere. I could not, for the sake of argument, set up the card to capture at a screen resolution of 100,000 x 480. This is a highly theoretical point because the "raw" video already takes me to the limit of what I could process at home. I am concerned though about file sizes and processing speed. A lot of the posts I have read are in favour of using DV because of these issues (some even talk about using the analog to digital pass-through facility on an old camcorder to do this - I guess the success of this route depends on what chip is in the camcorder and that's pretty hard to research. We know what chip is in the Canopus - this is covered elseware in this forum). A lot of posts praise the high end Canopus (the one with the single line TBC). But Lordsmurf is saying that for digitising VHS, DV is a bad move and that the uncompressed AVI with the ATI card which I have been trying to get a better understanding of is the route to go. So I will have files which are 2-3GB per minute of video. Also I need a processor speed of at least 1.5GHz (digitalfaq.com recommendation). The driving a car analogy is a good one. If I were learning to drive today, first I'd read about it, then try it out with assistance in someone else's car. Even when I thought I could drive safely, I'd do a lot more research before buying a car! So the conclusion I'm coming to is that the basic kit I need to make a good job of VHS is my existing VCR, a TBC (eg like the 8710), an ATI AIW card and a high spec PC. My hopes of getting by with the Canopus, my existing PC and DV are dwindling.! An analog source may contain an infinite (well, a large amount anyway) amount of information, but it doesn't contain an infinite amount of signal. The original embedded signal came from a man-made source which certainly did not contain infinite information, so any extra information now present in the analog source is just noise, which you are not interested in capturing. You are correct however that some of the discussion here has slightly glossed over the analog to digital conversion step. Yes, the analog video making up a line will be sampled and quantized in two ways, first in horizontal frequency and then in color resolution. However, if you capture at 720x576 (for PAL, I forget what it is for NTSC), 8bits per color channel, then you are capturing near as dammit the entire useful signal - in fact if the source is VHS then this is probably too much, and captures noise too. Also, I get the impression that you are thinking of AVI in the wrong way. I suspect you are thinking of AVI as a "base" file format to which a codec can be optionally applied on the outside - so eg. "raw" would be the AVI with no codec used. This is not correct. AVI is just a "container" or "wrapper". The AVI spec defines how the frames are indexed etc, but it says nothing at all about how the video inside is formatted. An AVI file always uses a video codec (a piece of software that has to be installed separately in Windows), and it's just a matter of deciding which one to use (or finding out which one was used, in the case of an AVI that someone sends you). The "raw" codecs do minimal work, so cpu time is minimized but hard disk I/O is maximized! Then there are lossless compression codecs such as Huffyuv - this works fast enough so that CPU is not usually a problem, but I/O overhead is reduced by a factor of 2-3. Then there are lossy compression codecs. These can compress by factors of 20 or so, but unless hardware assisted usually need a lot of CPU, in fact they may not be fast enough for live capture. Mmmm. So if I had a super duper analog source instead of VHS - not sure what that source would be - perhaps some professional quality broadcast tape - could I choose to capture at higher resolutions? I understand AVI is just a wrapper - so the ATI "raw" or "uncompressed" codecs are effectively defining the way the video is stored in the file. Whether the video is compressor or not, AVI uses a four character code (FourCC) to indicate how the video is stored the AVI file. 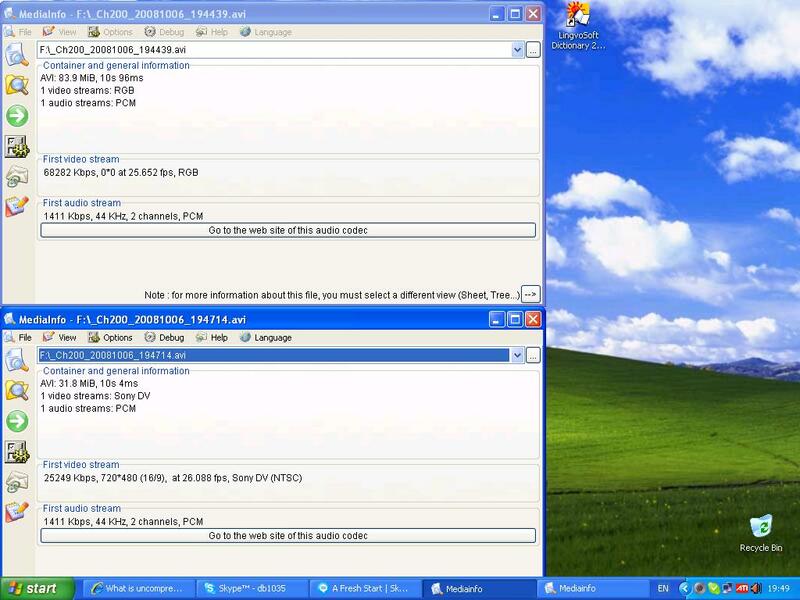 Windows (or a program) uses the FourCC to determine what codec to use to read the data. Even uncompressed RGB and YUY2 need a FourCC to identify them ("DIB " and "YUY2" respectively). So even though uncompressed RGB and YUY2 aren't compressed, they still need a codec (contraction of COmpress and DECompress) to read video data from the file. At the end of the day it comes down to what you expect out of the process. The un-compressed video will still have the noise from the VHS. That can be reduced by post-processing. And would you have enough PC power for both an original file and one in edit. A Canopus ADVC300 (I do own one) makes quite a good job IMHO of creating the base file for ferther editing. But if you simply want to archive these recordings and are not concerned with too much editing you could even manage with that TBC and a dvd-recorder with HDD. What you will never get is the visual quality of that Hollywood movie. Umm.. I think it's actually a contraction of "COder and DECoder". The coding doesn't have to involve compression. The front end of an ATI AIW is similar to conventional Brooktree or Philips based consumer tuner cards that A/D using supersampling (usually 54Ms/s) to avoid the need for high quality analog low pass filters found on expensive broadcast capture cards. The super sampled noisy signal is then digitally low pass filtered to 4:2:2 with Y typically resampled to 13.5 Ms/s and Cb,Cr to 6.75 Ms/s. This strategy reduces cost but captures considerable noise out to several harmonics. VHS can be thought of as noise containing some signal so the capture card leaves signal/noise separation as an exercise for the user to solve in the digital domain. Broadcast capture cards optimise a low noise high quality signal source by first analog processing and low pass filtering high frequency noise before A/D. For composite source, high quality Y/C separation is used vs. simple notch filtering used in consumer cards. The result is a high quality Y,Cb,Cr digital signal with minimal noise. So consider the distinction of low pass filtered high quality analog source vs. noisy supersampled VHS source when talking about "lossless" and benefits of 4:2:2 vs. 4:1:1 digital codecs. What you are doing is "losslessly" capturing noise vs. using a codec to filter or compress the input digital signal. Most of the quality issues with VHS need correction before A/D including time base correction, analog bandpass shaping and noise reduction. If this is done, the supersampled A/D conversion can be effective. Time base errors cannot be corrected after A/D. There is considerable "loss" during the A/D process. 54MHz supersampling for Y does sample ~2,800 times accross a line before down filtering to 704 active pixels but VHS luminance contains less than 3MHz analog bandwidth and only noise above that. Ideally VHS Y would be low pass filtered to 3MHz before A/D but it is not. All the noise above 3MHz including chroma crosstalk and harmonics get sampled. VHS contains considerable timebase error. Without correction, the timebase jitter is locked in by H sync referenced sampling and cannot be corrected in the digital domain. Again consumer capture card sampled "raw" VHS should be considered noise containing some signal rather than pristine video. Uncompressed capture requires a RAID to handle bit rate and uses considerable disk space. "Lossless" compression such as Huffyuv uses the CPU to compress data rate to within single drive sustained rate limits thus avoiding the need for RAID. When played back,the codec decompresses the video back to full uncompressed rate. The edit program or encoder needs to buffer those rates to temp files. Uncompressed editing (e.g. AVID, FCP, Premiere, Vegas) generally require large RAIDs to manage preview playback. Various "Digital Intermediate" or "off-line" or "Proxy format" techniques can be used to avoid RAID. DV was developed to scale this whole process to what can be handled by a typical PIII or P4 type PC. The "uncompressed" 4:2:2 digital stream is permanently hardware encoded to 4:1:1 YCbCr with 5x DCT in frame compression but with no interframe compression. Thus all frames remain intact with compression similar to JPG within each frame. The data rate is reduced from ~125Mb/s to around ~28Mb/s (including audio) which is well within sustained data rates of even laptop drives and brings file capacities down from ~75GB/hr to ~13GB/hr. "Pro" class editors support DV format natively for realtime edit preview and zero loss cuts editing. Another strategy is direct hardware MPeg2 or MPeg4 encoding at the capture card. The advantage is fast cuts only editing and DVD authoring but this approach limits restoration or image enhancement potential. drive safely, I'd do a lot more research before buying a car! Try editing short uncompressed or huffyuv compressed clips to understand the challenge. That will prepare you to enjoy DV or MPeg. Also try the various "restoration" filters using Uncompressed, DV or MPeg source to get a realistic feel for the technology. getting by with the Canopus, my existing PC and DV are dwindling.! DV is an option. It is fine for broadcast or camcorder source. For VHS source it is as good as any. The differences are at the second or third order of issues affecting image quality. Actually, it occurred to me to check the web right after posting the message, and of course I found that Wikipedia page. It's rather confusing. It's clear from the text that encoder/decoder is the original and sufficient meaning (as in this Websters definition: http://www.yourdictionary.com/codec), however some Wiki author obviously wanted it to mean Compressor/Decompressor too - so he gives that as an allowed alternative but without providing any citation to back it up. Oh well, I don't suppose it matters much. I think the OP is getting bogged down in too much detail. The problem with totally uncompressed AVI is that the data rate is just too high, you will drop frames. There is NO advantage to doing it this way, compared to Huffy or one of the other LossLess codecs. There will be ZERO loss of quality in using Huffy or a similar lossless codec. The file sizes will be quite large, but using Huffy drops it to about one-quarter of the uncompressed size. One thing to note that nobody ever mentioned and I figured out over time, is that Huffy is not designed for playback efficiency and may fool you that there are non-existent issues. Re-encode it, and the problems go away. I'm on my fifth ATI capture card, and have been capping with these for many years. Capping AVI allows for significant post-processing, filters, and custom encode settings. These can definitely improve VHS recordings, at the cost of significant time and effort. However, VHS source is still poor quality. This type of conversion was my original goal, as well. It did not take long for me to totally abandon this method. Using a good quality Digital source, finally ending up with the S-video output from an HD cable, satellite, or OTA channel allows the use of real-time MPG encoding. The quality comparison is not even close. Star Wars from a brand-new tape, decent SVHS deck, AVI capture and re-encoded, looked like absolute crap compared to the same movie from HDNet, S-video to real-time MPG, not to mention it was on-disk a few hours after broadcast instead of days later. Anamorphic widescreen, progressive video were just bonuses. Subtitles possible, AC-3 with additional hardware. I have very few non-replaceable tapes, other than SVHS-C camcorder tapes. Even with these, the real-time MPG method carries only a slight size penalty over re-encoded AVI, and since the tapes are short, this is a non-issue. For older tapes requiring filtering and special processing, the Lossless AVI method is probably the best way to go. As far as the capture resolution, it is fixed. Your only choice is what to resize it to. 704x480 is the closest DVD-Compatible resolution to what the card does internally. I still find that 15,000k MPEG-2 I-frame only looks almost as good as any other "lossless" AVI method. That takes up less space, and quality is similar. It can be edited just fine in a modern NLE, such as Adobe Premiere CS3. I've returned to this question after a few weeks abroad. edDV has provided a very helpful reply. I was wondering how the sampling across the horizontal line worked and this was a helpful explanation. Nelson37's point seemis mainly to be that if you're digitising VHS movies, you're much better not bothering and getting a new generation source instead. I agree. It also helps you avoid copyright infringement. I have irreplaceable VHS though. People seem to agree that lossless compression eg with huffyuv is a useful way to overcome some of the space/speed/size issues. edDV says a consumer card leaves signal/noise separation to be dealt with in the digital domain. How can s/n separation be handled in the digital domai? edDV also says it is better to do some work pre-digitisation: noise reduction, TBC and analog bandpass shaping. TBC is easy enough - use a TBC. But how to do the other things? Is the answer simply "use a broadcast card"? If so, any thoughts on what would be a suitable "broadcast card" to use? I've been checking out ATI AIW cards. ATI stopped making them in 2006 though it's possible to get them 2nd hand. It seems (Wikipedia) that they just started selling them again - this time an ATI AIW HD - for HDTV. I'm not clear whether these would be suitable for VHS capture like the old models. .rm to uncompressed avi on OSX?